Between 1939-1945, 166 female pilots were part of the Air Transport Auxiliary (ATA), a British organisation that delivered new and refitted aircraft from the factory to the RAF. This left the male pilots free to go to war. In an age when women were generally considered best suited to the kitchen, these formidable young women broke into the all-male world of military flying and soared above the opposition they encountered from the flying establishment and the RAF. Pauline Gower was the force behind the formation of the Women’s Section of the ATA. 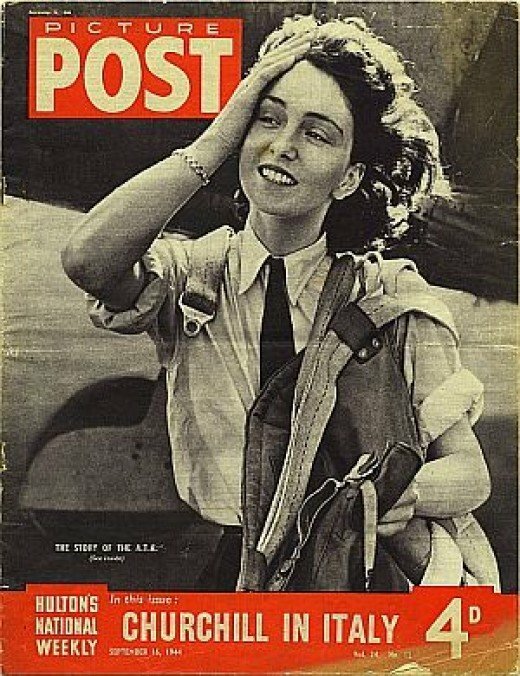 An experienced pilot, she used her influential social and family contacts to persuade the Director-General of Civil Aviation that using women to transport planes to the RAF was a great idea. Finally in late 1939, after initial bureaucratic resistance, the idea became a reality and Pauline was appointed to head up the female flyers. The first eight ladies (known as “The First Eight”) were recruited initially to fly light training planes to the RAF in the north of England and Scotland. All were highly-experienced pilots and seven of them were instructors, but it was felt ‘better to let a woman break a cheaper plane than one of the more expensive models’. This attitude slowly changed and, gradually, more female pilots were recruited. By the end of the war, 166 women had been a part of the ATA. Collectively they had flown many different types of aircraft from light trainers to heavy four-engine bombers, including the Tiger Moth, Gypsy Moth, Lancaster bomber, Hurricane and the beloved Spitfire. The women had come from all around the world—28 countries in all, including Chile, UK, New Zealand, USA and South Africa. The pilot’s uniform consisted of a pleated skirt, slacks, a one piece “Sidcot” flying suit and quilted liner, a sheepskin leather “Irvin” flying jacket, a blue service tunic with four pockets, a belt with a large brass buckle, a great coat and a forage cap. Women had to purchase their own blue shirts, black nylon stocking, black shoes and black necktie. On landing, some of them used to do their makeup and hair, emerging from the planes looking fabulous! Officially, slacks were only allowed on the base and a skirt was to be worn off-duty. The same rule applied to the very warm black leather fleece-lined flying boots, but both rules appear to have been routinely ignored. Admired and adored by the press, these exceptional ladies were the glamour girls of the age and consisted of two groups: the “Head Girls” and the “It Girls”. However, flying was a dangerous profession and flying during wartime even more so. Some of the pilots died whilst carrying out their duties, including the famous pioneer aviatrix, Amy Johnson, who was a part of the ATA until she died in 1941 during a ferry flight. These women were inspirational, incredible and pioneering, even though they humbly saw themselves as simply doing a job—and they did it incredibly well, often flying in the most terrible weather conditions, without radios or instruments and often in the face of resistance.